I had a dream. In this dream a man would drive a car on the track. He wouldn’t own this car, yet he would have all the joy and happiness as if he actually owned it. His expenses would be low and his debt modest due to his loving girlfriend’s trust and/or gullibility. This was a beautiful dream that would leave me slightly sad when I awoke. Surely I couldn’t become this man. With my awkward personality and face only a mother could love, no girl would date me, let alone be foolish enough to let me drive her car at speed. But this my friends, is America. Dreams still come true and slowly, the dream has started to become a reality. First the girlfriend, then the Miata, then the rollbar, seats and brakes to get it track ready. 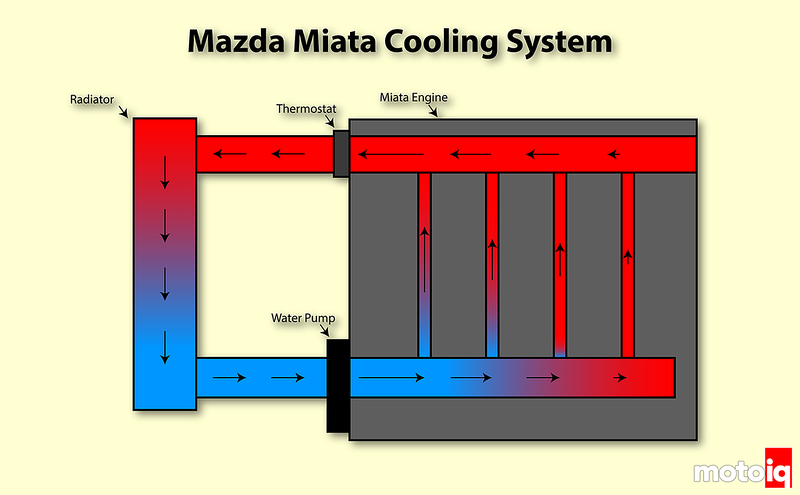 The last piece of the puzzle was improving the dumpster fire Mazda calls a cooling system in NA Miatas. With the help of Koyorad, my vision, foretold many years ago, is ready to be fulfilled. 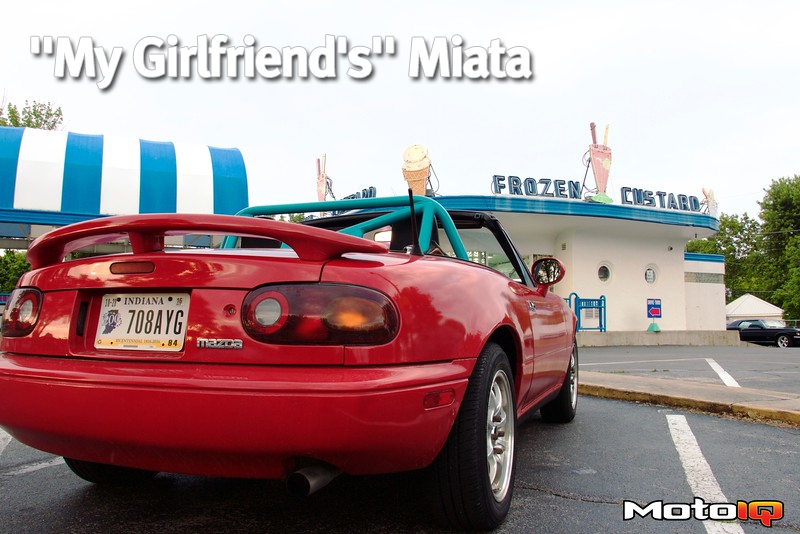 So why does God’s greatest gift to humans, the NA Miata, have a terrible cooling system? The story starts long ago when Mazda decided to base the 1.6L B6ZE engine for the Miata on the 323 GTX Turbo’s engine, without the turbo. This sounds all well and good, and honestly it is for the most part. The engine was an improvement over the standard Mazda B family design. With a stronger block and oil squirters to keep the pistons cool, Mazda then went with lighter connecting rods and a lighter flywheel, to give the engine a nice, sporty vibe. Unfortunately for the cooling system, they sort of forgot that the engine was transverse in the 323 when the placed it longitudinal in the Miata. Here's what happens when you take a transverse engine, mount it longitudinally and take the lazy way out for designing the cooling system. 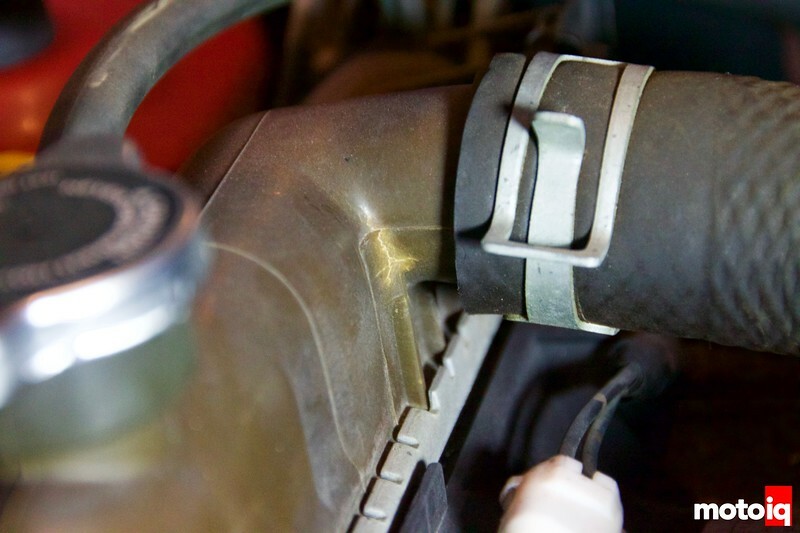 Cooled coolant enters the bottom of the engine and takes the path of least resistance, going up to the thermostat via the shortest route. This leaves cylinder 4 without much coolant circulation and because of this, the back of the engine runs at higher temperatures. Combine a mediocre cooling system design with a smallish, 23 year old radiator with cracks reminiscent of Clint Eastwood's face and you can understand why I had reservations about hitting the track without making a few upgrades. What had happened was, in the front wheel drive layout of the 323, the coolant ran through the engine front to rear, working just perfectly and cooling the entire engine evenly in the process. In the Miata, apparently front to rear was not an option and the system was routed bottom to top… on just one side of the engine. This leaves the back half of the engine significantly hotter than the front. Mazda later designed a head gasket that forced more coolant through the back of the engine, but only for the 1.8L block models. On top of that, our radiator was seeing better days with cracks starting to appear on the plastic end tanks. These were just waiting to snap at the first sign of stress, not unlike Kanye at an awards ceremony. The cooling system savior arrived in the form of Koyorad's new Hyper V series drop-in radiator, which replaces previous Koyorad 36mm and 53mm designs. The new Hyper V is a two row, 36mm core design and features a higher core density than the previous models, improving cooling capabilities without the need for the thicker core. 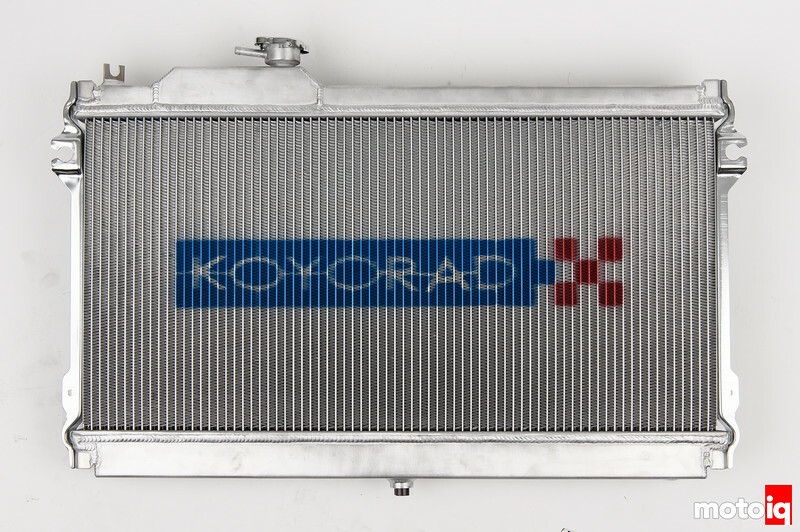 The Koyorad radiator is a two core design constructed to extremely high standards with beautiful TIG welds and polished aluminum replacing the crimp-on design and brittle plastic used for the end tanks on the original OEM radiator. Quality control is a big priority and all Koyorad radiators are triple pressure tested at the Koyorad factory. Also notice the 1/8″ PT temp sensor port next to the upper coolant inlet. This is designed to work specifically with most aftermarket Japanese coolant temperature gauges and an easy way to get accurate coolant temps so one doesn't have to rely on the standard dash gauge. The Koyorad Hyper V is a true drop-in with mounts and tabs for all OEM fans and hardware. 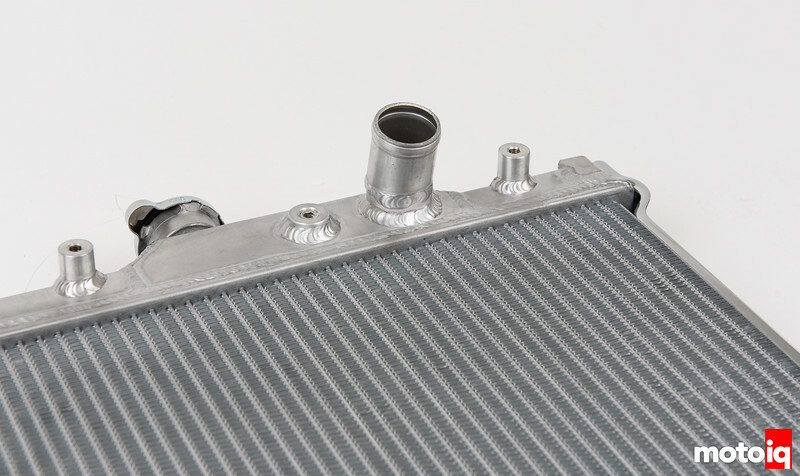 The side brackets and included are to OEM quality which helps make the install of the radiator a very simple and dare I say, fun job to accomplish in just a few hours time.